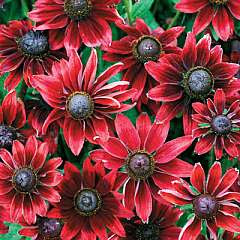 Following the 2002 success of Cherokee Sunset, Thompson & Morgan flower breeders are proud to present the first-ever red Rudbeckia from seed! These robust plants have outstanding garden performance, producing a mass of attractive, cherry-coloured blooms all summer long – triumphing over heat, drought and poor soils! Stunning when planted in drifts in borders or can be planted in large containers to create a feature plant on a patio or terrace. Sow seed on the surface of good, free-draining, seed compost. Cover with a very fine sprinkling of compost or vermiculite. Place container in a propagator or seal container inside a polythene bag and place at a temperature of 20-25C (68-77F) until after germination which usually takes 7-21 days. Do not exclude light, as this helps germination. Transplant seedlings when large enough to handle into trays or 7.5cm (3in) pots. Gradually acclimatise plants to cooler conditions for a few weeks before planting out after all risk of frost, 30cm (12in) apart.